Pyrrha a bit of a mystery. We have had a few conversations around the barn as to what breed she might be but nothing really fits. But no matter what type of horse she is, this mare is strong as a brick house! 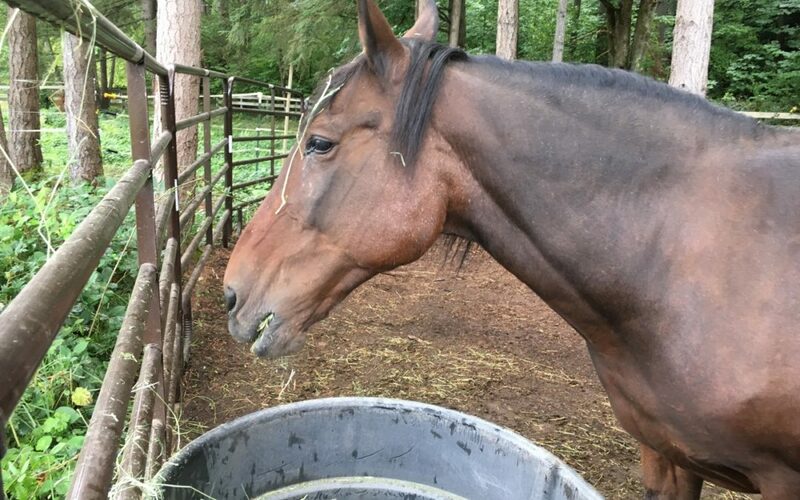 She’s most likely been around the block and seen many people and horses come and go in her many years. 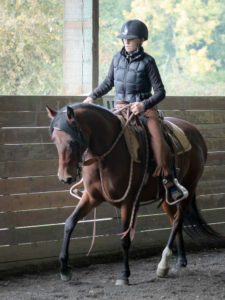 We still are uncertain her age but given her swayed back and body condition, she’s probably getting up there in age, so it does not make sense for us to attempt to restart her and put her through the stress of being a riding horse. She is healthy, seems to have good vision, and is a steady as they come. She and Sage could probably tell the younger horses a thing or two about life. Pyrrha is pretty bonded to Sage and seeing them together is pretty darn cute. If you visit them in their turnout paddock you will often find Pyrrha hanging her neck over little Sage who is content resting in the shadow of her wise friend. Recently the volunteers have noticed that Pyrrha has been quite interested in Asha and the commotion around the barn in preparation for the imminent foal. She has been seen staring at Asha and calling to her if she is not in her stall. Maybe she can tell something exciting and wonderful is about to happen or maybe she just wants Melinda to go to bed and spying on the pregnant Asha during the night on foal watch! Pyrrha may not have youth on her side but she does still have a lot to offer a family. It would be wonderful to place her with someone who has time to dote on her and love her these last few years of life. 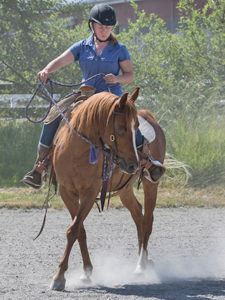 She is a confident mare and makes a steady addition to a small herd. We have kept her off of the rich green grass to help maintain a good weight but she would probably be fine on some pasture most months of the year. 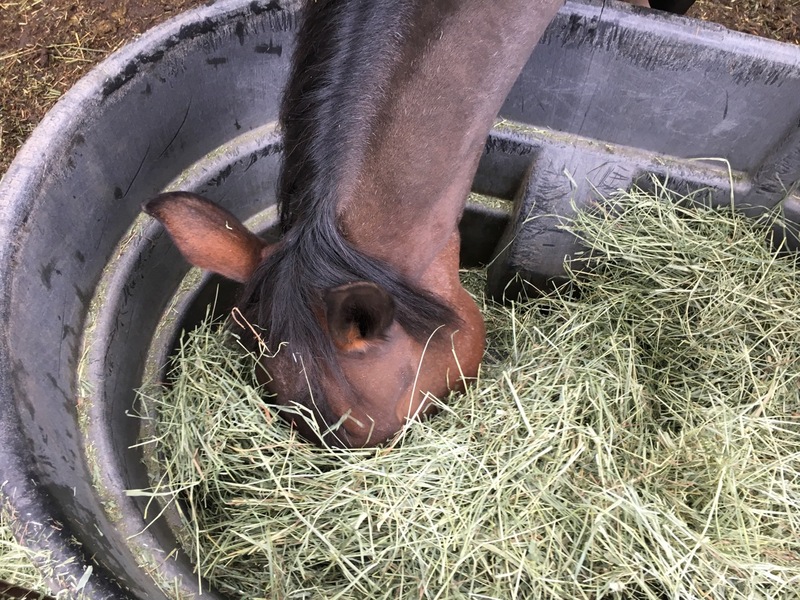 She requires no medication at this time, chews her hay well, and does not require large amounts of senior to maintain weight. 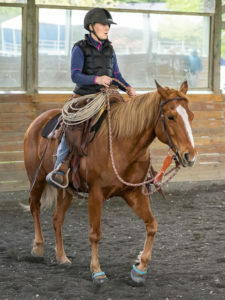 Overall she is a very easy mare to get along with and would make a nice quiet addition to a family looking for a buddy horse. Below, Pyrrha prefers the hay at the bottom of the feeder!